Vegan What??? : A vegan dieter's paradise, the low-cal vegan cupcake. A vegan dieter's paradise, the low-cal vegan cupcake. As a low-cal eating vegan kinda gal, I am always on the hunt for low-cal treats that embrace my vegan lifestyle. In September of 2009 I became a member of Sparkpeople.com (a FREE online community of people all seeking to lead a healthy lifestyle through eating, fitness, goal setting, etc-if you check it out and decided to join my user name is KATSMEYOW, put me down as a reference!! ), I quit WW and became a Sparkette. Once you join this online community you have access to nutrition trackers, fitness tracker and many other tools. You join teams, add friends to your profile, write blogs, comment on other peoples activities, and you have access to over 25,000 recipes that have been entered by Sparkpeople users. 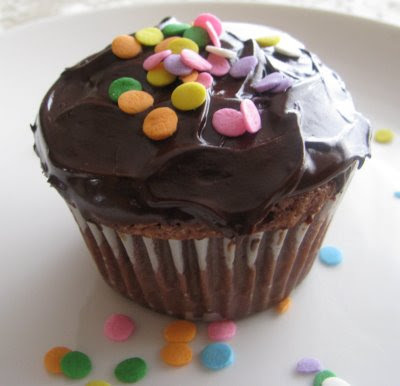 I stumbled upon this soda cupcake recipe (some of you already know about this recipe), where you simply add a can of diet soda to a boxed cake mix. It's low-cal/low-fat and is supposed to produce really moist cupcakes. I immediately, upon finding this recipe began to research which boxed cake mixes are vegan friendly. I was pleased to find that MOST of the Duncan Hines mixes are indeed friendly. So a couple of weekends ago I made carrot cake cupcakes, adding a can of Hansen's diet ginger ale. I also created a vegan cheese frosting to go on them (which was AMAZING!!). All around a HUGE success. This time around I made Devil's Food cupcakes w/Dark Chocolate frosting and a sprinkling of sprinkles!! Instead of adding diet soda this time, I used Club Soda. The results were fantastic. Actually better than using a flavored soda, the club soda didn't add or subtract from the chocolaty goodness of the Devil's Food flavor. And the best part....without frosting each cupcake only had 75 calories!! With frosting 100 calories each. Not bad for a low-cal vegan treat!! Yes and I have you to thank for eating at least 15 cupcakes when you left the carrot cake ones at my house, and I am probably going to make the same mistake with the choc. ones. They are delicious! So, you don't add anything but the soda to the mix!?!? No oil, water, eggs? And what frosting did you use for the chocolate cupcakes? Yep, nothing but the soda!! I used DH Chocolate Fudge frosting....also vegan friendly. The mix will be VERY fluffy, so don't freak out! did you use DH devils food cake? and is it a 12-oz can of soda? I did use the DH devils food cake mix and a regular sized can of soda. I've also made them with just club soda, it doesn't add any flavor to the cake mix. I am so glad I found your blog! I am going to try to make these for my son's first birthday "smash" cupcake. I hope I have results like you did! I have tried dozens of vegan scratch recipes, and they have turned out chewy every time.